second at 37 weeks, I thought I was in for another “pre-due-date” babe. both to trust in Him and find peace within your body. -by Robin Jones Gunn. Thanks to Lara Nabours for passing this poem on. sugars found in refined foods, like white flour products. e.. Remember to exercise- swimming is best. night sky- connect with your creative and spiritual side. causing back wall ruptures of the uterus. i.. Avoid people who give you fear “vibes”- even your mother. (as long as that doesn’t involve chocolate bars). is smart enough to pick her own birthday. fits an arbitrary timetable or not. and gently shaking the tree has no effect on getting them to come off. “There is a sort of chemical ‘combination lock’ that starts labor. Everything has to be lined up just right to ‘unlock’ a good labor pattern. Added February 2015: Ever heard that the placenta has a “limited time life” or the “placenta ages”? It’s simply not true. Here’s the link to the full study (1997) and the conclusion. This entry was posted in Holistic midwifery & doula education, Homebirth by Gloria. Bookmark the permalink. Such useful and needed information! It was so hard to wait a believe that nature would take its course, but I am so glad I did!!! I am not sure why my last baby boy felt he needed to be 10lbs 12ozs but I am sure that he knew what was best! The best part is knowing that my body really did now what to do all on its own! Megan – thank you for your comment – it’s so reassuring to hear your testimony. I am 9 days overdue and expecting my second big baby. Really want to birth naturally again and struggling at times to keep the faith! Hi Gloria – I’m from the UK, I love your site, thank you. As you can see in my other comment I’m 9 days overdue today. I am 5 ft 4 and my first boy was 10 pounds (and half an ounce! ), born naturally, in hospital, one day over his due date. I managed it by doing most of the labouring at home, arriving at hospital in time to push (staying upright). This happened with no pain relief or intervention, asides some monitoring due to meconium in the waters. This experience was so good, and gave me so much faith in my body’s design (and it’s designer). However, I find myself with more ambivalent feelings now, since with this, my second pregnancy (another big boy), I am now 9 days overdue. I know that this baby will at least match, if not surpass his brother’s birth weight. I had to set a date for induction at my hospital check up yesterday, and although I feel a bit anxious, I still argued for them to at least let me wait it out until 42 weeks, which they have agreed to. I got up at 330am this morning since I could not sleep and felt the need to search the net for comfort – finding it here on this page, particularly in the poem by Robin Jones. I’m gonna wait and keep trusting – any other comments, information or testimony that you can point me towards in the meantime, would be gratefully received. I went 43 weeks with my second child & had the best birth of my two boys! AND that 43 week pregnancy was a VBAC! Mother & baby did GREAT! Hang in there! Your body knows what it is doing. I must commend your site as wisest concerning this. Im 41 weeks and have defied odds, I had an op from my first baby in april last year. With this current pregnancy, my gyne wanted to do an op on me on the 1st even tho my boy was officially due on the 21st. I’ve gone past that date, as i write u this mail, its on the 29th today. I must say that it’s not easy but trusting on the one who started this life inside of me knows and knew and arranges the best time. Its on the listen to the body and making informed decisions. It is so nice to hear words of encouragement!! I am 42 weeks 1 day, today and have decided to continue on without being induced. My husband and I decided this after our non-stress test came back perfectly fine and an ultrasound showed that baby had plenty of room to move around. I was also checked and I am not dialated or dropped at all, maybe only 25% effaced. Meaning that an induction probably wouldn’t work anyways and would leave me with no choice but a c-section. From now until baby decides to come, I am just going to stay at home and relax and avoid every negative person and comment that comes with leaving the house. It is so sad that in our society today I have to hear things like “It’s not safe to be overdue!” (at 40weeks 2 days!) and “you better find another doctor!” 40 years ago they didn’t even have Pitocin! And babies were born just fine! So, much power to all the mothers out there who are overdue! Listen to your body and you will know what to do! How do you keep from not being induced if this continues to come.. I would love to hear some updates from any of the ladies or any other person who went over 42 weeks and didnt induce or went ahead and induced and there store of when the labor started.. I def dont wanna do pictocin!! Thankyou so much for this post. I have a 2yr old, whom I delivered naturally, 1 day before his due date & all within 6hrs total. Now I’m going on 7days past my due date & my doc is pressuring me for induction in 5 days if no birth. I am so against this idea, but she’s concerned about the placenta getting too old. What does that mean exactly??? The placenta goes bad? Stops providing nourishment to my baby? Doesn’t funtion good enough?? Does anyone have any info on this placenta issue? I have an appt Tue & is everything is OK, I really want to refuse to be induced. Thanks for your comment, Jess. Remember that the placenta is an organ of the baby’s body. Do we ever think that the other organs–heart, lungs, liver, etc are getting “old” when a baby waits for Nature to tell him/her to be born? NO. So, why then does the placenta which is visible get this bad rap? just a further question, perhaps inspiration for a blog post. I am not alone! I never would have believed it! This is baby #8. The first 2 were induced and after that I said “NO MORE!” so, my earliest is 8 days late, the next was 9 days late, and 3 of them have been 2 weeks to the day. I am 42 weeks this coming Monday and I am getting so very tired. But I don’t want to induce, so I guess I will just go take a nap. Even my OB doesn’t question me anymore. Hang in there, everyone, who is in it right now! Thanks for all your stories and the encouragement. I can keep going! I wish I had looked for other “overdue” moms and stories when I was pregnant with my first. Perhaps I would have been able to fight the 42 week induction harder (induction quickly lead to c/s). With my second, I went over 42 weeks and had a very healthy baby naturally at home. With all of my babies I went over. my first I had a c-section at 42 wks because 2 attempts at induction failed. my next baby was a vbac in the hospital and I was only “allowed” to go to 42 weeks by my doctor. My midwife gave me blue cohosh and it did help me go into labor but I went in way to early and stalled like crazy so even though I had my vbac it was filled with unecessary interventions that left me sore for weeks. My last baby was my UBAC and I went to 43 weeks, delivered without a problem. I felt great and my body did exactly what it needed to do. I don’t like “overdue” as a term. Overdue for what? Library books can be overdue, babies come on their birthdays. When we say we’re overdue we’re just buying the obstetric myth that there’s a due date. Thinking about how we frame that stuff can really open up how we respond to gestational length. Normal is a wide spectrum in birth. I don’t think we do ourselves any favours when we count pregnancy in weeks, how about a due month? A due season? And stay away from people who believe in the myth of due dates because they also believe in induction. Dating scans should be one of the early on red flags to send women running. If only it were so, hey? Love your post. You are right. Babies come on their birthdays. There are two distinctions of time in the Greek language. One is measured time that is controlled and calculated (our Western view of time). The second is the time when an apricot is perfectly ripe. A different time altogether. A time that occurs in the world of Mother Nature that can’t be compartmentalized and predicted. 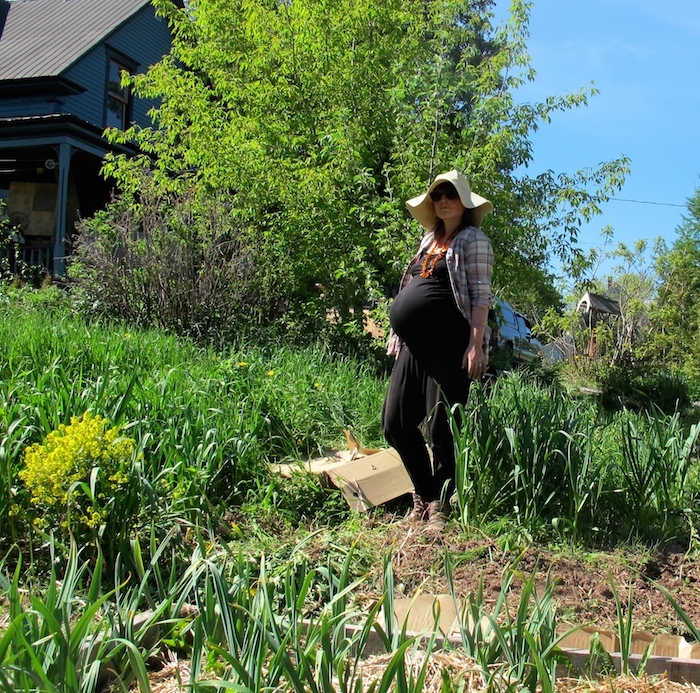 Women who garden understand that time and I think it should be mandatory for all pregnant women to garden through their pregnancies. Dear Hoan, the first thing is to stop anyone from examining your cervix. It doesn’t give any useful information and can lead to infection and rupture of the anmiotic sac (waters). 8 lbs is an average size for a full term baby. Besides that, ultrasounds are notoriously unreliable. Thank you for all the encouraging words. I am 41 weeks and 4 days. My induction date is in 3 days. When I went over 40 weeks my husband and I were so very disappointed. I felt like we let everyone down, too. Then the waiting was hard, but more so the phone calls, texts and people asking or commenting was the hardest. The feelings of not knowing became feelings of thinking something was wrong with me or my body. We tried every labour induction method (herbals etc..) and nothing worked. This week is better and there are some sweet poems and advice about being ‘overdue’. I feel so much better now. Knowing that I’m not the only woman waiting and not the only woman feeling like this. Thank you for posting everyone. Hello. I am 42 weeks today. It has been so lovely to read all of your stories and to feel supported that their are others who decide to wait, despite the doctors waggling their fingers at you. My first child was 13 days late. So i presumed this one would come late too. The hospital has said they want to monitor me every day and have booked an induction for xmas day (when i’ll be 18 days over in their eyes). Because they keep telling me the placenta is now probably diminishing i am feeling more and more nervous. Can’t sleep, worrying i’m being too stubborn etc. I have been having small contractions and lost my plug following a sweep a week ago….so surely things must be moving? I want to keep waiting but feel like my nerve is failing me (because of all the negativity from hospital and family). My first baby was a home birth. This one has to be in hospital due to being ‘overdue’ and mild anaemia. Anyway i’m rambling. It’s just been nice to offload as in this process you can feel very alone. Good luck to all you lovely pregnant ladies. And thank you for this site. Even though your original post was 2009 and I’m in the first quarter of 2011, it’s a PLEASURE to read this post and the comments to follow! My #1 was 11 days OEDD (over expected due date), #2 was 14 days OEDD, #3 was 17 days OEDD and they were ALL born healthy! It is SO difficult to face the crowd, though… even though I’m preggie with #4 and haven’t even reached 40 weeks, they are already there joking about “still” being preggie. I get it mostly at church and I’m thinking about skipping after this Sunday if this baby decides to be like his/her sisters’ because it’s just too much to deal wtih sometimes. I mean, we already have to battle the dark whispers that come at our mind as we face labor, in general… we don’t need any more hits from voices MUCH easier to hear! I visited this site A LOT! I had a great homebirth. Thank you to all the ladies for posting your experiences. Hmm. I have a problem with this sort of canned response, just as much as I do to the ones that say we have to birth before 42 weeks. I guess it is personal to me because out of 5 children (all my pregnancies), 4 have gone past 42 weeks. And maybe this was more toward chemical/hospital induction. I trust birth, and I trust my body. I have had 5 natural pregnancies, and births, with no drugs, and all of my children have been born at home. I love birth. I embrace labor. I think I like labor more than the end product (ha). ;o) Okay, so with my 4th baby I was bound and determined not to “induce” (because I induced with castor oil, my first and third pregnancies, and my second came “on his own” but I did everything BUT castor oil and he was still born 3 days shy of 42 weeks). So I waited. And waited. And waited. AND WAITED. At 43 weeks, 6 days I took castor oil. I was just HUGE and uncomfortable. I couldn’t wait. I am a very healthy person. During that particular pregnancy I walked 3-5 miles most days of the week. We lived in Hawaii at the time and we had wonderful weather that allowed me to exercise often. And I did. I was in labor within hours of using castor oil, and we were blessed with a 10 pound baby girl 8 hours later. Yes, 10 pounds! My children before her were (in order of birth): 8 pounds; 8 pounds 12 ounces; 8 pounds 5 ounces. So she was big – even for me (in my opinion). It was a bit different pushing her out because I felt her head “scraping” against my bones as she came down (not exactly what happened, but it is what it felt like). I took castor oil at 42 weeks with my 5th baby as well. He was 9 pounds 12 ounces. I have never thought of myself as a “stressed” person. But after this pattern, I wonder if there is more I could do to “unwind” myself in pregnancy because maybe I am inhibiting oxytocin release. With my 5th, my husband was deployed up until my due date. We weren’t worried because of my history. He was home in plenty time. Again, I don’t feel like I am stressed, but I wonder if I actually am and don’t know it. Does that sound crazy? If we have more children, what can I do? Honestly, and maybe selfishly, I don’t want to be a 43 weeker. It is hard, and painful to be that big. This coming from someone who LOVES being pregnant! @Amanda Carmen -momma of five-Will you ever see this – posted almost 9mons after your post? I wonder the same thing about my body. I’m almost 36wks with #3. My first and second birth were both drug induced at 42wks. I didn’t know how to fight it- that I could or should. I’ve been wondering if I am psychologically fighting the birth of the baby. With my first, we had a major move when I was 36 wks – mentally, was I not ready for the second major life change so soon? And my second was 15mon younger than her sister – was I scared of what it would be like to have two so close together? (It’s wonderful, by the way?) I’d LOVE LOVE LOVE to have a natural labor, where I can do most of my laboring at home and be in my own environment. But I’m already huge – and if I have to get induced anyway – does it make a difference if I’m induced at 40 vs 42. “Have to” because my practice won’t let me go longer. Anyway, this time around I want to have this baby as soon as possible – or as soon as he is 8 or 9lbs. Thanks for letting me rant. Does anyone else think that psychological reasons can affect the birth date. Oh, and you mentioned that you enjoy labor more than the end result – tongue in cheek – of course, but I tend to agree – The first 6 weeks are not my favorite. I wonder if that fear keeps me tight and closed off to labor, also? Lord, have mercy! I love how God works! A friend of mine “overdue” was searching and found this blog entry, and then found MY response, and linked it, so I went to read what I had written, and saw YOUR (Kimiko!) response to me! Amazing! Since writing that, I went to a midwifery conference where a doctor spoke of progesterone deficiencies in women and the affects on pregnancy, labor and birth. One of the points he made was that he believes that it is possible that women with borderline progesterone might not have enough that when progesterone levels drop at the end of pregnancy – it doesn’t push them into labor. That was a mouthful, but hopefully you follow. So I kind of wonder if that might be why I don’t really go into labor on my own, but my body does get pushed into labor pretty easily with castor oil induction. I have other reasons to believe I have progesterone problems, but I won’t go into detail. You could look up symptoms on the internet probably. Even though I find it hard raising children, I do LOVE the newborn stages! Can you have a homebirth? I am 42 weeks now and plan on a home birth. This is my fourth pregnancy, fifth baby, first homebirth. I was induced at 38 weeks with my twins, scheduled for induction the second time but went into labor on my own the night before and was induced at 41 weeks last time. My twins were 7 lbs 6 oz and 7 lbs 8 oz, next was 8 lbs 15 oz last was 9 lbs 2 oz. I’m not afraid of delivering big babies because I have done it before, I’m just getting extremely frustrated with people. When I tell them how far I am they look at me like I’m a ticking timebomb. My midwives have been very encouraging and this site has given me new hope. Although I hope I deliver in the next week, I no longer feel despair at going beyond 43. Thank you! Just want to add to the encouragement that is here. I went to 43 weeks by the EDD very sure it wasn’t earlier ~ though possibly later (and almost 44 weeks if you go by the charts, since I have long cycles). It was a great pregnancy and the only difficulty I ran into was the MD’s/CNM’s who took over for the LPM once I went past 42 weeks (the “legal” cut-off in my state for LPM’s). The CNM’s wanted me to be induced since they insisted, statistically, I was entering risky territory, the placenta was deteriorating, and basically I was risking stillbirth… when I asked them to produce documentation of aforementioned stats or provide me with one piece of data that supported their ideas they could not, and though I provided them with clear information to the contrary they did not want to accept it. I ended up showing up to the hospital dilated to 9cm and having DS approximately 2.5 hours later without even an IV. He was 10lb 1oz with a 14.5″head and a nuchal hand/arm. It was still a bit of a fight in the hospital to avoid interventions. Further, I specifically asked the scowling CNM to show me the placenta after it was delivered and she said it looked “very healthy.” I specifically asked if there were any calcifications or signs of deterioration? The reply was, of course, no. I will say that I jumped through A LOT of hoops those last 2 weeks to prove that we (me and my baby) were healthy but I didn’t think they were altogether necessary. I did it more to justify my refusal to be induced, and at the same time it supported my own peace of mind. Knowing what I know now and didn’t then I will not jump through those kind of hoops in future pregnancies unless it’s to satisfy my own curiosity and peace of mind rather than to support an argument. I will simply point back to my first pregnancy. Blessings to all you moms who are post-dates. If you’ve posted on here about waiting for your little one(s) to arrive, I for one would love to read a follow up on how things turned out. Hi, I’m a doula and have just had a woman reach 43+1 with her first baby. At this point they decided to Induce (medically), but did however try all natural induction methods first at around 41 weeks+, obviously to no avail. Medical induction of AROM and Synt drip but on AROM cervix was found to be thick, long and so closed that it was hard to get the hook in. OB said it felt like a ‘dimple’ and as tight as a rubber band, and asked the woman if she had ever had surgery on her cervix, to which she has not. After 12 hrs labour cervix was still firm, slightly stretchy and 3-4cm. She did not progress past this point over the next 4-5hrs so was taken to theatre for a CS. Any advice or thoughts on firstly a woman going to 43+ weeks, and also the findings of the cervix at this point in the pregnancy? Is there anything else we could have done? I just had my first baby 3 weeks ago at 43 weeks on the dot. When I got pregnant, I had been charting, and did not ovulate until CD21, so I lied about my LMP at all of my appointments (and all of the early ultrasounds and fundal heights matched this). SO glad I did, because at 43 weeks I was actually 44 weeks past my LMP! Once I hit 41 weeks and some change, we did twice weekly NSTs and ultrasounds. I felt GREAT and the baby performed like a rockstar on all of the tests, so the doctor very very reluctantly “let” me keep going. I think more than anything he knew I would decline an induction and didn’t want to waste his breath trying to bully me into one. I was not dilated at all at 42w3d. I went into labor naturally at 42w6d. I ended up having a rough delivery with a lot of interventions I had hoped to avoid, but it wasn’t because the baby was big or because we had waited! He was 8lbs 9oz, 21.75″ long, and his head was only in the 25th percentile. If I had to do it all over again, I wouldn’t change a thing! My water broke, then nothing happened. We figured I was 6 weeks overdue, as the doctors continually changed my due date and then told me that I conceived when I absolutely could not have, which put me another month back. Anyway, after two days since my water broke and my contractions were all over the place and I was not progressing I was scarred by my midwife into going to the hospital. Worst experience ever!! They induced me, didn’t turn the baby when she was posterior and had her sunny side up without drugs. I ripped from top to bottom, ugh. Awful experience. My recommendation, GET A DOULA!! I would have gotten drugs if they would have given them to me, as is 63 hours in labor wasn’t enough. She was born 4/4/2011 at 4:26 pm at 8 lbs 14 ounces. You asked about what maybe could have been done differently, so I thought I would chime in! First, I think an induction was a mistake. CLEARLY her cervix and body were NOT READY! You simply cannot force a body into being ready…you can medically make it LOOK ready…even produce a baby…but it was not really the body’s timing. Due dates are such BS!! There are several ways to tell if you are really “overdue” or if there is any REAL danger to the baby. Things like monitoring amniotic fluid, NST, fetal movement, ultrasounds if necessary…and if these things show a perfectly healthy baby, then leave them alone!! We are soooooo hung up on “going past the due date” that we completely forget that our bodies and our babies know better!! Sorry for the rant! I hate hearing things like “we HAD to induce…” or “due to being overdue, we had to…” or “they thought the baby would be too big…” UGH! It’s smoke and mirrors to detract from what is really happening…the convenience of the doctors who simply do not care to wait. I am thankful for reading all your comments. I am 41 w 4 d today and feel pressured to produce a baby. I have a midwife and I have hired a doula for the birth, but my midwife told me she MUST counsel with the OB on call this coming Thursday (when I will be 42 w). She also gave me a cocktail (with verbena oil and 2 T of castor oil) which she told me I can take anytime up to Wednesday, but not past that, as the risks increase after 42 w. Does anyone have an opinion about the verbena cocktail? This is my 3rd baby and I would like to have an unmedicated birth. My first birth was traumatic, I almost bled to death, and the second one was better, but not normal. I had epidurals with both. I would really like to give my body a chance to start labor on its own – this way I feel I have a chance to have a natural, unmedicated labor. Just a quick update – through a series of circumstances, my midwife broke my water two weeks from my due date. There was a normal non stress test and a good ultrasound the morning of that day, but when my water was broken there was thick meconium in the liquid. My baby was monitored continuously (through wireless equipment, so I was able to move around freely in the hospital room, and even be in the shower for a time). He was born, with no problems, at 8 lb 4 oz. The placenta was very calcified, and the skin on my son’s hands and feet was very wrinkly (signs of an over due baby?!) I also managed (through God’s grace only) to have a completely unmedicated birth, which I desired very much. Having had 2 children with two different doctors (the first one being totally incompetent, and the second one being wonderful), and one child with a midwife, I hands down LOVED my experience with the midwife. If I were to have another child, I would immediately enlist midwifery help. Besides getting to know them a lot better than I knew my doctor, and feeling like they REALLY cared for me, I was pleasantly surprised by their postpartum home visits. Thank you again for this site – it was great encouragement for me. I am also thankful for the counsel of my midwives, and for the fact that I did allow them to induce me. I will never know what would have happened had I said no to the induction, and I am glad I didn’t have a chance to find out, as the dangers of meconium in water are very real and grave. Good luck to everybody who is facing a decision about induction and may God bless you all. Gloria, your website was a treasure trove of information and a real comfort to me while pregnant with my third. I wish I had been better informed with my previous two pregnancies, but won’t waste time regretting. With my third (born in August 2010) I had a midwife–which was a huge improvement over the OB and hospital situation I’d had before–but somehow I imagined she would be different… more confident somehow…. when I started going “past due”. The midwife team was offering a check and possible stretch and sweep from week 39. By week 40, because of their comments that the baby was so low and I seemed so ready, and this being my third I’d probably be early, I already felt “late”. They were sure that a s&s would get things going. I became somewhat afraid to go more than an hour away from home (where I wanted to deliver) just in case. Anyway, long story, as I imagine all recounting of births are, but this experience left me feeling that midwives in Ontario are really not so different from doctors. There’s a definite benefit to having a midwife over and OB, but in the end, they are restricted by the same rules, they are taught in the same way. If I were to have another baby (but I don’t think I will) I would much prefer a more calm and confident midwife. Ideally, I’d have liked to hire you, or someone like you! Thank you so much for having this blog where I returned time and time again to read about normal pregnancy and normal labour. It really helped. Dear KD, Just read your post one year later. I was so moved by your saying you just wanted to breathe your baby out. That is so right, so simple, so healthy. And yet so frightfully misunderstood and, yes, even attacked by healthcare workers, be they MDs, Nurse-Midwives or lay-midwives, male or female. I am, by profession, a physical therapist. My personal orientation has always been to help my patient relax. Breathing is the bottom line. Ahh….full exhalation. Some years ago I started working as a labor assistant. The first birth I attended was in a birthing center. This is what I saw: A radiant, young woman lying on her back (1st child) breathing out, pleasurable sighs, during contractions, eyes sparkling, cheeks rosy; her husband at her right shoulder breathing with her, her best girlfriend at her left side breathing with her, me, at her left foot breathing with her. I remember between contractions she looked at her husband adoringly and said to him, “Oh John, I love you so much.” The woman, clearly, was experiencing great pleasure, as I certainly was, as well as her husband and friend. We were all in love. The baby was crowning….she had a lot of dark brown hair. Then. her eyes were visible and she was looking around before her nose was even “out”. At this point, the mid-wife, who had not been breathing said to the woman: “Ok, now you must hold your breath and push.” The woman looked bewildered. “Hold my breath and push?” she asked. “Yes”, The midwife authoritatively repeated, “Hold your breath and push.” I regret to this day that I did not speak up in her defense. In my opinion, the midwife was clearly wrong. Everything was going perfectly. But it was my first birth and I was not in charge. The woman did as she was instructed. The color of her face changed from rosy and glowing to ashen gray. Instead of pleasurable release she had pain as she pushed her baby out. The baby still was a bit of heaven. But the woman’s perineum tore from the pushing against held breath. That probably would not have happened (or at least, much less) if she had continued at her own pace, breathing. Breathing enables the muscles to let go. Birth is about letting go. Your instinct was in the right place. Dear KD, I know that the women in the College of Midwives of Ontario read this blog so you are letting them know what you experienced. Your story is very common wherever midwives are regulated and have hospital privileges. The doctors that give out the hospital privileges put pressure on the “midwives” to practise just like physicians—aggressively. Rather than stand up and do the right thing by women, the midwives go along and justify their acquiescence by saying ‘Well, at least we make birth better for a few women.’ It’s a cruel trick to play on birthing women to call this midwifery. As all the other women above have said, I am so thankful I read this today! I’ve actually read this a month or so back, and totally agreed with it – but now I’m 42 weeks exactly, and have to go see my midwife today. At our appointment last week, I was getting some very very slight vibes of fear from her. I can’t really explain it. I don’t really like using the word fear to describe it…maybe concern. Anyway, today it was really affecting me, because I’m afraid she’s going to mention stripping my membranes or something(maybe I’m just over reacting). I’ve already decided that I’m waiting until this baby is completely ready, but as everyone knows your resolve tends to weaken over time, because who really wants anything to happen to their precious baby? Anyway, today I took the time to go through the comments which I hadn’t done before. Such encouragement! It’s completely put me at ease. I have a feeling this baby will be coming soon anyway. Last week I was 1cm dilated, 40% effaced, and the baby had already dropped 2cm. I’ve had intermittent contractions since then(which I had never experienced before), and lots of cervical twinges(I have had those, but they’ve increased). I can tell the baby has also dropped some more. I know my midwife will want to check me again, so I’m hoping for a favorable change. Even if there’s not, I’ll still feel very peaceful and calm about waiting. 🙂 This is my first baby, and I’m doing home birth, so I plan on coming back here and posting my birth story once it all happens! I write as a mother, grandmother, and neuro-diagnostic technologist who has worked at a major childrens hospital for 31 years. I help diagnose brain injury in newborns admitted to our regional Neonatal Intensive Care Unit. These babies come to us in distress..we have not caused their problems or participated in their births. While I agree that all the sentiments expressed above are lovely and desirable, I implore all moms who are pregnant beyond 40 weeks to fully educate themselves about Meconiun Aspiration Syndrome, its causes, treatments and outcomes. This is NOT a condition made up by a hostile medical community. I have seen and touched with my own hands countless perfectly normal post term babies with everything from mild respiratory distress to severe brain damage from lack of oxygen because they inhaled meconium during the birth process. It’s real, it happens and the treatments, and damage to lungs and brain, are far worse than anything that happens with an induced birth. THANK YOU THANK YOU THANK YOU for this blog and all the comments! All of you have confirmed my and my husbands feelings of waiting till our son is ready to come. Elliot is baby #2 and my due date is days away. The doctors are hinting towards induction if he doesnt make an appearance soon, esp since i am not dialated past a “loose” 1. I had a mid-wife with my 1st son, and labor was a total of 38 hours. I did it on my own for 24 hours at home and then let the mid-wifes assistant scare me into going to the hospital. It was a huge mistake. The whole hospital experiance was stressful. The gave me pitocin without my consent just to try to make me dialate quicker. (by this time it had been 24 hours since labor began but only an hour TOPS since my water had broken. Baby and i were fine…no stress). Furthermore the doctor refused to listen that the waters had already broken and i got the shoved (none too kindly) up there…ON TOP of which, i had SO many doctors checking my dialation my husband put a stop to it. Laboring at home was wonderful, i regret ever going into the hospital. My son was born 7lbs 10 oz and just fine (and a week past the “due date” i might add). I firmly believe that the whole experiance would have been better with out the pitocine and have let the doctors know that this time i DO NOT want it if it can be avoided. I am so glad to hear so many people confirm what i know in my heart to be the right thing to do, and that is wait on my body and baby the good Lord for the right time. We’ve unfortunately had to go a 100% medical route this time as we are in the military and stationed overseas. The doctors appts are always stressful, and from now on out i will refuse to let them check my cervix (i gave into the nurses pressure to do so, wishi hadnt). My mid-wife never checked my cervix till i was in actual labor with my first. I hate hospitals and doctors breathing down your neck they know you and your baby better and i am DREADING having another hospital birth. THANK YOU for the words of encouragement it is appreciated! I am a home birthing mom of 5 children. (I have 6 children) I went 41 weeks with the first, fourth, & last. The others were 2 weeks ‘over.’ I think the last one was only a week over because I was taking 3 separate last 6 weeks (5w & 6w) capsules, as well as a tincture to soften the cervix, (blue or black cohosh, which is it?) knowing my tendency to carry long. Three have had meconium staining in the labor. The last baby had meconium at the start in my water breaking. They’ve all been PERFECTLY NORMAL & HEALTHY. My first birth & only birth in the hospital was terrible because my midwife ‘abandoned’ us because my water had been leaking over 24 hours. She she sent us to the hospital. She had previously been a L&D nurse, so she had seen all the complications the hospital interventions caused. She brought that fear to my labor. I was induced on pitocin for 17 hours of pure torture. I hope I never EVER have to go back to the hospital for a birth. They just have no patience for your pregnancy or your labor to go long. When I went 42 weeks to the day with my second baby, first home birth, I was very nervous about it because I’d never done that before & everyone says don’t go over. I was being advised to go in to the hospital to get induced. I KNEW I didn’t want to go through that again! I was pouring my heart out the the Lord when I felt like he said, “You’ll go into labor tonight,” & “My peace I give you, not as this world gives, give I to you.” I must say I seriously doubted it & thought I was just trying to give myself positive thoughts. However, two hours later my water broke & I had her about 24 hours later. I would never do home birth without the protection of my heavenly Father, as it is great to be under His umbrella of protection. I had a friend at church who is also a home birther and all her pregnancies went to 42 weeks and one went 43! All healthy & happy. She was a great encouragement when my 5th preg. went to 42 weeks and I was getting lots of negative comments. My best advise would be to turn to the Lord & give your burdens to Him for He cares for you. Hi Gloria-Awesome and encouraging Article! I went to 42 weeks with my last trying for a HBA2C. However, ended up with another c-section after pushing for hours and baby going under stress. He was 11lbs with a 15 in head and 16 in chest and never could get past the bone. Anyways, I am wondering if there is a coerlation between women who have had previous c-sections and going into labor later. It seems like the people I know this happened to (VBAC), went into labor later. I have heard this may happen with women who have had a previous C-Section. I am wondering why? Would that tie into your body going into natural labor or other situations tied into your bodies response for labor? Hope I am making sense here with this? It’s hard to explain. Here I sit. 42w pregnant. I read and I read. I am so worried. The world around me screams two sides. GET INDUCED!! and JUST WAIT!! I don’t know what the right answer is anymore. I feel completely lost. This is my 3rd pregnancy. 1 miscarriage (early) and 2nd live birth. My first baby water broke at 38w2d with Strep B+ and NO labor. Induction, Epidural, Antibiotics, MISERY. We had planned a home birth, but midwife did not do antibiotics, and I was not in labor. No one thought I would even make it to 40w with this pregnancy, yet here I am at 42 and doubting everything I ‘know’. I trust God. I no longer trust my body. I feel completely lost in a sea of fear. I know my dates (we charted diligently and had a hard time TTC), and I know I am 42w (give or take 4 days for conception). I fear something being wrong with my baby though the tests come back fine. I don’t know how long I feel comfortable waiting for my body to do something. I hate the idea of induction, natural or otherwise. I don’t FEEL like it should have to be that way! Of course I don’t want to risk my baby. It is a scary place to be for me right now. I see the midwife again today (still planning a home birth), and we will be talking natural induction methods… if that doesn’t work… HOSPITAL. I have so many emotions and thoughts running through my mind right now I don’t know where to begin… I feel like “WHY?”. Pray for me please. I am curious about the comments about muconium inhalation syndrome. I thoughoughly understand the dangers with it. I was induced at 37 weeks due to low fluid, which was total bs when my water actually broke there was a lot of fluid, but also because of ‘early’ preeclampsia. ( I still have some question about this since all of my urine drips during labor were totally free of protien). However, my son did inhale the muconium during the induction. I have a feeling that this was because of the continued strength of the pitocin contractions as the water was clear when it first broke. Why is this considered such an issue for 40+ gestation babes? I have had lots of friends who went early and whose babes inhaled the muconium. I just wanted to say thank you to Gloria and all the brave ladies who posted on this site! I am 40 and 3 with our first baby and found myself very discouraged and down in the dumps passing (barely) the due date. Even though I know better from our Bradley Method prenatal classes and our midwives it was/is easy to get discouraged and bummed out. We are so excited to meet our little one but we are willing to let him/her tell us his/her birthday. Thank you all again. I’m 41 weeks +9 days. I am so bothered by all the buzz around me freaking out. I am holding strong and know that this baby will come when he is ready, its just hard when others make you worry. This was super helpful. Sometimes I feel just like the lady in the post said, that i’ll be the only women in the world to not give birth to her baby..ha ha that made me laugh out loud when I read it cause I seriously have felt that exact same thing! Being positive is key. I am so glad to hear about the sugar thing. I NEVER eat sugar ever, but this week being so frustrated I ate a dounut today more out of frustration..so glad to know that this is a BIG TIME NO NO, I have not eaten sugar at all during the entire pregnancy. It’s always been a NO NO to me during the entire pregnancy so I’m glad to know this and how it can effect late in pregnancy just as much…I will not do any “emotional” eating after reading this. Love love love reading all your posts, strong mommas! I am 42wks 1 day with my first & just about at the end of my rope, feeling like a huge turtle (lol) & am so ready for this baby to come. I trust my body and believe my baby will come in his or her due time but its so difficult when so many are screaming the dangers in your face & your just so physically & mentally tired at this point so late in the pregnancy. Good luck. Let us know when baby arrives. Stick with your instincts and it’s so nice to know we are not alone. I’m 41 +5 right now….every day hoping and praying it will be the day but trying to be patient and surrender to what baby will choose for himself. Thanks for this blog and what a great thing to read about others in the same situation. I went to 43 weeks + with my first and although I stood my ground against induction and started at home we had to move to hospital because of merconium once the waters broke. That’s when it all went to heck. I was already a stressed Mamma from all the pressures and fears and stats and although I had done research and found plenty to reassure myself you always have the doubt and fear that something will go wrong and yes, it’ll be YOUR fault. Long story short after unwanted interventions galore I ended in in a C-section. I have greived that for the past two years very much. As I sit here I am at 41 weeks and 5 days waiting for number two and planning for a home VBAC. I have been recommended to be induced no later than 41 weeks but have declined. I am fortunate to have a supportive midwife who has had experience working in other countries where attitudes differ slightly but she is still bound by the “rules” and regulations here. In order to support me she has to stick her neck out quite far. This is a shame for all midwives and all birthing women. I have been doubting myself so these posts have renewed my strenght. Thanks so much again. I will update with my birth story once it comes……So far in order to please my midwives I have had 4 cervical stretch and sweeps ( I refused with number one but since it’s a VBAC and their levels of anxiety seemed off the charts I agreed) Nothing has happened. I have also had 3 x accupuncture treatments to encourage labour as a “natural induction”. I have also tried homeopathy under supervison of a certified homeopath. All this folks and nothing doing. Increased tightening, uncomfomfortable and painful cramps from S&S, more regular Brackston Hicks, cervical twinges galore but baby is just not ready yet. I also find myself questioning my faith but Why? It’s my baby’s own timing and I know that. I also did some interesting research into my family birthing history. Most of my maternal relatives live overseas. Turns out they all carried to 42 to 43 weeks with almost every pregnancy and that includes cousins that have had up to 7 kids! For them it’s no big deal and “normal”! Ha how different a perspective. All went on to have natural and uncomplicated labours BTW not one C-section. One of my Aunts even told me of her 3rd child waiting until 43 weeks. She was going mad as she puts it and her midwife and GP both stopped in to see her at home (home visits common where she lived) and both checked her and sympathetically told her it didn’t look like it would happen that day or even that week. She was just feeling like crying about that when things got started about an hour later and she had a very short and intense labour producing the baby in about 45 minutes once things were in full swing. The midwife just made it back to her house in the nick of time to be there for the delivery. These kind of stories made me feel so much better and more “normal”. Maybe I’m not such a freak after all and maybe genetics play a bigger role in birthing timing and styles than the medical community knows or acknowledges. I was also thinking about research design. You know when they write up a nice research paper they “clean up” the data. That means removing or throwing out any data points that lie outside the nice bell curve they are looking for. Perhaps we are those data points. Because we get thrown out as anomalies and data points to be ignored they forget that we are real and do exist even if we don’t happen to just follow the curve of the majority. Anyway, best to all of you and stick to your heart, trust your instincts and say a prayer. The good Lord has designed a very wonderful and varied world and it’s OK to be one of those variations. One always has to weigh the risk/benefit ratio. The risk of using chemical induction which statistically leads to major abdominal surgery is very great. The risk of waiting for the baby to come with good diet and taking care of yourself are very low. Weigh and balance things. No one can give you guarantees about anything to do with birth but we do know that the only two things that have been proven scientifically to produce healthier babies are 1. improving the nutrition of the mother 2. social support for the mother. Everyone wants to scare the post-dates lady in today’s medical climate. Doctors want to be able to say, in the rare instances where something does go wrong on it’s own, that they “did” something. And very few of them care whether that something was medically necessary, as long as it protects them during a malpractice suit. The bottom line is that it’s better for the doctor’s insurance rates and reputation if the baby or mother DIES, and doctor “did everything in their power”, than if the baby or mother is even slightly damaged, and the Doctor didn’t jump on the induction to cesarean band wagon. This translates into countless babies being born too soon, countless ruptured uterus (uterii?? ), an obscene number of unnecessary cesarean surgeries, and an epidemic of “iatrogenic prematurity”. And that’s just the tip of the iceberg. If you’re concerned, get a Biophysical profile done. Count movements, but accept that they’re harder to feel (the little ones) when the baby has no room to move. And stay peaceful, happy, and RELAXED because stressing out will delay labor. And research research research. I can’t stress this enough. The RESEARCH supports allowing your baby to come when ready. The RESEARCH shows that the “due date” shouldn’t even be 40 weeks, but rather 41+1. Then if you factor in that conception dates can be wrong, and every baby’s needs & mama’s body is unique, you can easily tack on another 2-4 weeks on either side of that date. Ask yourself this question: Are you willing to force your baby out, only to risk winding up with major abdominal surgery & a premature baby (a genuine possibility)? What are the REAL documented risks, in a WELL-NOURISHED mother, to going “overdue”? Look into the links between chemical induction and uterine rupture, or autism. And to the ones who will tell you that your baby will get too big to be born vaginally, I invite you to learn how to get up off your back and squat. It will open the outlet of the pelvis by up to 20-30% . And big babies hurt LESS, not more, since they more efficiently cut off the circulation to the perineum, creating numbness during crowning. I’m speaking from experience here, with vaginal births from 9lb 5oz up to 11lb 10oz. The bigger, the easier. One of my cousins was 13lb, also vaginal. You can do this. Your body was MADE for this. Your baby was MADE to pass through YOUR body to be born. If you want to “do” something, watch your posture & walk walk walk. Help the baby settle in comfortably. If he/she’s posterior, try some positioning or even chiropractics to help him face the other way. And remember: Induced labor hurts. It hurts so much that once you’ve had an induced labor, and then an uncomplicated natural one.. the natural labor feels like nothing to complain about at all. Induced labor fails. And when it fails, you’re on your way in the vast majority of cases, to the operating room for a c-sec that you could’ve avoided. You can do this. Be strong, and be patient. It’s the introduction to motherhood, when those traits will serve you well. This document is a great gift for every post-dates mother and I want to thank you for it. I would have loved to see it while I was pregnant this lat time. — Of my 4 children, they have always run late. 41+3, 41+3, 42, and 42+4. I allowed the first two to be induced, but I’d learned better by #3! There’s something very satisfying about telling people that your baby is only 2 weeks old, when they look like a 2 month old to most people. Or watching your almost 3 month old try to crawl and sit up. What’s the secret? Let ’em cook as long as they need, lots of loving boobies, and keep them in loving arms instead of across the room. Thanks for creating this page! 41 weeks is long enough for me, and I don’t even know if i’ll opt to go that long with this baby. I did NOT come all this way to have something devastating happen, like eating a ton of sugar (which i definitely do) and have my baby die. No thank you, I’d rather be induced. I love the site! Love the poem etc. Slightly surprised by the ice cream sunday comment. It seems a pretty bold/dangerous assumption that a baby died from the mother eating two icecream Sundays, even with gestational diabetes! What a great find! I had monitoring done today at 40+5 and they wanted me to stay so as to induce. I refused. This is my fourth pregnancy – first +9days, second and third both +3days, and this one. I was sure this baby would come out +3 also. I am a bit nervous as apparently the heart beat was a bit erratic – there was no baseline in their opinion, it was illegible. It varied from about 110 to 170. The hospitals in Italy are very cautious about lawsuits, and made me sign that I didnt want to go in tomorrow for monitoring. Apparently the growth is slightly less, though none of my children has been big – the biggest at 3.5kg. I had two different doctors perform an ultrasound today- the first one didnt even bother to leave the results, and hence why I had two done, but had said there was enough fluid, whilst the second said it was starting to decrease. Now I dont know if it was to make me think I needed to be induced. I am still confused and my husband says to just induce if in two days there is nothing. I didnt know of these other risks with induction. Any consoling words Gloria?? I am glad to have found this site and feel encouraged by the wonderful posts knowing i am not the only “overdue” pregnant mum in the world. This is my #2 baby and we are 41 +7days already. I have refused to be induced but wait for the timimg of the Lord. I am healthy and baby too is doing just fine. Although i have to admit that i get worried as the days go by and still no sign but i remain hopeful. God bless you Gloria for this great site! Wow the comments seemed to have gotten more negative over the years,sadly. At first it was helpful and then became harmful. thought i found those mamas who carry little longer. I am very grateful for this site. I was 40 weeks pregnant when my Dr told me that i was to be induced since i was showing no signs of labour. But, as i went through this site, i was encouraged when i read so many women condemning induction.i felt a bit relieved and i had to persevere for 2 more weeks when i had my handsome baby boy . Gloria, i will tell you that this site is very very enriching. If not for this site i would have gone for an induction. What are your thoughts on the usefulness of postdates monitoring that is *offered* (aka bullied on) to mothers who go past 41 weeks? e.g. NST, u/s to check placenta? Is there any other type of monitoring that you would recommend? I went to 42 weeks with #2. I was bullied into daily trips to the hospital for NST and u/s even though I was planning a homebirth. I was so upset and distressed about all the hospital trips that I am sure it delayed labour starting. But my husband really wanted some reassurance that everything was OK. THANK YOU!!! I have been very worried as I am a new mom and 41 weeks and 5 days overdue. I have been going to the hospital daily since 40 weeks and 5 days for NST and monitoring. Baby seems very happy, and the nurses have assured me that the baby isn’t experiencing any stress at all. I have been worried thinking something is wrong with me, that my body just doesn’t want to birth this child!!! Im so glad I found your site, it made me feel normal, and made me relax. I can relax now and trust my body to do whats right when its ready!!! None of my 5 have been born near 40 weeks. My longest pregnancy was 44 weeks exactly, the others were 43 weeks, 43 weeks, 42 weeks and 41 weeks. I sought information like there was no tomorrow with my first “overdue” baby and then again with my even more “overdue” baby as I wanted unbiased research I could take to my bullying health care professionals who believed I was uninformed about my choices. Thank you for all the work you do Gloria. What a glorious photo of a goddess! Thanks for keeping us all sane in this insane world, Gloria. As a child therapist, I fully support moms who allow their children to arrive in this world in their own time. I believe that it makes for a calmer baby and this calmness follows the child through life. Not being “rushed” right from the start is a gift to the baby. I wonder if there is a correlation between inducing a birth and anxiety in children? It would be an interesting study. 2 of my children were born at 42 weeks, one at 43 weeks and my last was 40 weeks. all natural births, one at home. my doctor was not too impatient. none of the children seemed post dates – they were all just perfect – and the first 3 were all 8 pounds 11 ounces! I have 7 children and am expecting now. My 1st was born at 38 weeks and the other 6 have all been born at 42 weeks. I expect this one to go to 42 as well. Thank the good Lord they have all been born naturally. I have used hospitals, birthing centers and had 2 unassisted. Doctors have attempted to push me into inducing several times. I enjoy reading your articles, they are very encouraging. Thanks! I am so happy that I was invited to check out this blog. This morning I woke up at 5 am and haven’t been able to sleep since. I am 41 weeks and 4 days. The suspense is real people! I read all of the posts and they have encouraged me so much. Today I will see my midwife at the birthing center for my 41 week appointment to see if I have indeed dilated at all. I have had 4 false labors, and they are exhausting. I do feel, however, that they are preparing my body for the REAL thing, which I hope and pray is soon. If I don’t have our baby by this weekend, I will be sent to be checked at our local hospital. I was nervous about this until I read these posts. Now I am ready to go in confidently and get an ultrasound done. I ultimately desire a natural birthing center birth on MY babies cue without induction!! 😉 Even though I am big and uncomfortable, I have had an extremely easy and beautiful pregnancy. And what’s a week more? Thank you all for your support. Thank you for this inspirational website/ poems. I am 39 weeks and 2 days. My due date is coming up in 2 days. This is my fourth baby and have not waited this long for my baby to come out. Thanks for reminding me that there is a time for everything. I will wait patiently for my God the creator knows when this bundle of blessing will be coming. I just long to have my body back as I have a little one year old who will be needing my attention as well. All this waiting is making me irritated at everything even my spouse. I will trust and leave everything in the makers hand. I faced the decision of whether to induce at 42-weeks with my third baby, Jack, now nearly three. Our two older children had been born naturally, 10 days and 14 days overdue. Those days of waiting are excruciating. With every day that passes, you become more and more convinced that there is something wrong with your baby.